As you may know, a couple of weeks ago I decided to become a complete and utter sellout by monetizing on my blog. Guess how much I've made so far? 83¢, yes, eighty-three whole cents! Woohoo, I'm rich and can almost buy a rather small chocolate bar as long as it isn't from anywhere that sells them while they are still in date. Anyway, encouraged by this huge success, I've decided to put my limited design skills to work over at CafePress. 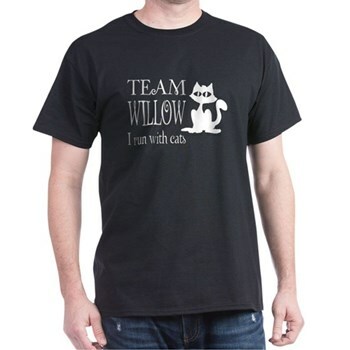 Apart from slapping my site logo on everything to see what it looks like, I have now come up with something truly awesome: the "Team Willow" t-shirt (below). Yes, it's a parody of all those "Twilight" t-shirts since I know how much you all love the films. 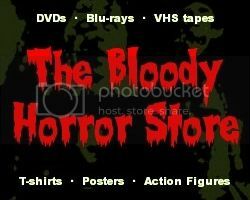 Now you can support my site in style and buy a tin of cat food for my constant companion at the same time. I'll get almost 50¢ from each sale and it's all going on cat food. Look at Willow, she's so hungry!!! All 20lbs of her is wasting away! "I'm not fat, I'm festively plump!" 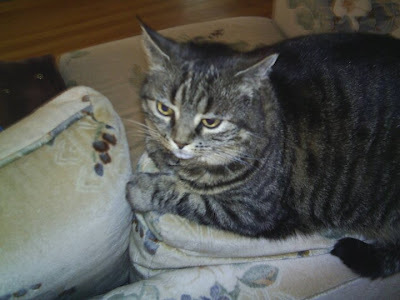 My other cat is not impressed but she's content to eat anything in her path right now or sleep. She has, however, previously expressed an interest in having her own Macbook Air. All donations are welcome and much appreciated.